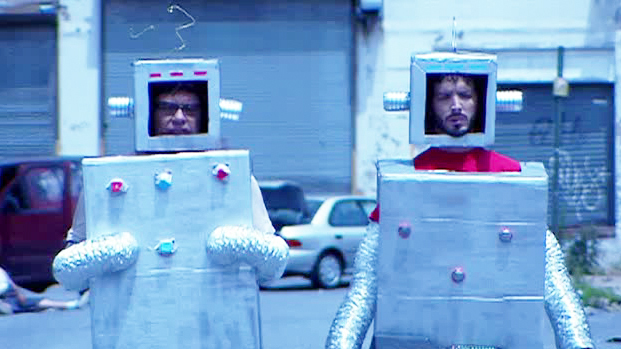 of course, treatment the humans are dead. Look in a little more detail during the AM peak, with relevant images. At the Guadalupe/45th timepoint, there were 21 trips passing by after 6 AM and before 10 AM (headway was 11 minutes). Applies to NUNA and Hyde Park. Stops every couple of blocks, so assume a short walk straight west to Guadalupe. (In 2008, the Route 3 ran down Guadalupe from 38th to 29th, and then jogged through West Campus a block or so to the west). 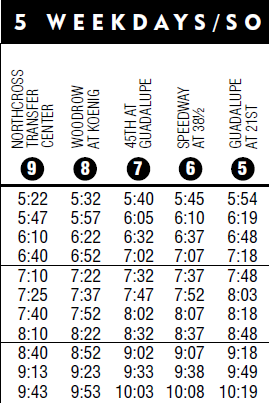 At 34th/Guadalupe, there were 11 trips passing by after 6 AM and before 10 AM (headway was 21 minutes). Applies to NUNA only, not Hyde Park1. Stops every couple of blocks, so assume a short walk straight west to Guadalupe. (Ran/runs across 45th to Speedway, turns right and heads through center of Hyde Park and NUNA, then west to Guadalupe at north edge of UT). At 38th/Speedway, there were 9 trips passing by after 6 AM and before 10 AM (headway varied from 15 to 30 minutes). Stops every couple of blocks along Speedway so you can assume a mostly direct, short, walk. 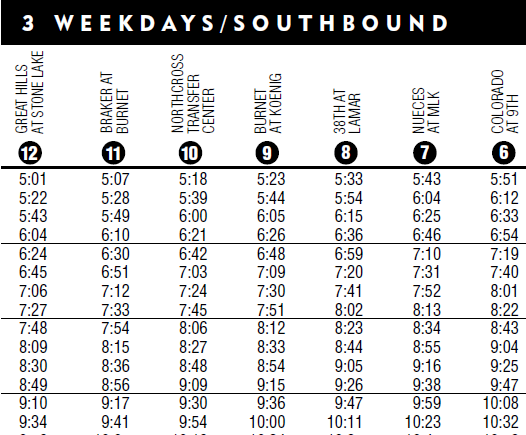 The IF runs basically the same route as the 5, from 45th to UT. However, it is not suitable for use by the general non-UT population. It doesn’t go south of UT to downtown; it doesn’t run on non-class days; it doesn’t run during breaks when normal people have to work. 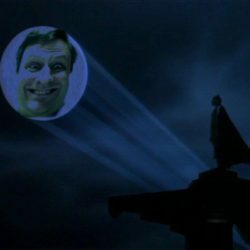 At best it’s an emergency backup. I might should. When I did this wayback exercise I wasn’t thinking of it, but the 19 was somewhat useful south of 38th, if I remember correctly. I might go back and correct if enough people clamor for it. Very short segment on Guadalupe, not generally north-south in ways that would be useful for this exercise. (Ran on essentially the same route the 801 runs today, hitting most of the same stops – not all. Stop at 51st instead of the Triangle; stop near 38th served NUNA a little better and Hyde Park a little worse than current 801 stop closer to 39th. Note that no other stops are served than the few dots on the map in the PDF linked above. So it’s 51st, 38th, and then UT.). At 38th/Guadalupe, there were 7 trips passing by after 6 AM and before 10 AM (headway was 15 minutes but only started at about 7:30 and ended at about 9:00). Counting for both NUNA and Hyde Park as this was the designated ‘express’ for both (no closer option), and we’ll do the same later for the 801, but indicated as ‘long walk’ in both cases. 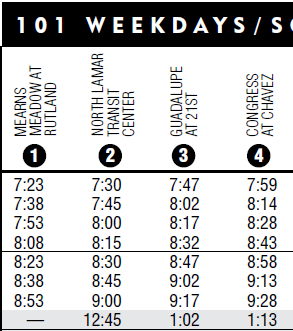 For a resident of western Hyde Park, you could walk to Guadalupe and expect a route 1 every 11 minutes, a route 101 every 15 minutes (unless very early or very late), and you could walk east to Speedway and expect a route 5 every 15-30 minutes. Total local buses for southbound peak available: 30. Total limited-stop buses for southbound peak available: 7 (long walk for some). For a resident of NUNA, you could walk to Guadalupe and expect a route 1 every 11 minutes, a route 3 every 21 minutes, a route 101 every 15 minutes (same caveat as above), or you could walk to Speedway and expect a route 5 every 15-30 minutes. 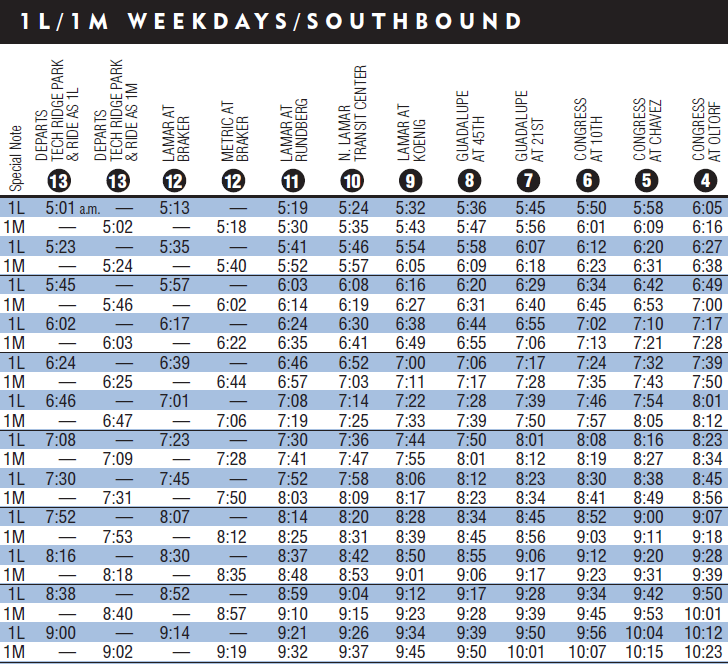 Total local buses for southbound peak available: 41. Total limited-stop buses for southbound peak available: 7 (long walk for some).